The PlayStation 4 release of Yakuza Kiwami is a remake of the original Yakuza, which debuted on the PlayStation 2 in Japan in December of 2005. I didn’t play it in 2005, or in 2006 when it arrived in North America. I really, really should have. Instead I foolishly disregarded it and its sequels completely until my PlayStation Plus subscription placed Yakuza 4 into my library in January of 2015. Finally I would experience the incredible brand of storytelling and amazingly detailed environments that the Yakuza series is known for. I loved it, and would spend hundreds of hours in the cities and streets of Yakuza 4, Yakuza 5 and Yakuza 0 in the years that followed. And though I’ve experienced the story of the first three Yakuza games on YouTube, this is my first time playing the original. The question is: can it still be called the original? Or, for all of its updates and new features, should Yakuza Kiwami be considered something different entirely? There’s a pretty difficult decision to be made for those of you that have already played Yakuza. Is there enough new in Yakuza Kiwami to make it worth a repeat visit? As someone who missed it the first time around, it piqued my interest easily, but also felt very familiar as I played it. Many of the new features are borrowed or outright copied from the other games in the series to make it feel modern, but the end result is that it instead feels like something I’ve played before. Then again, that’s not necessarily a bad thing, given the history of the series. Perhaps the main mechanical change is to combat, which brings back the four fighting styles that Kiyru –our protagonist—could use in Yakuza 0. The entire game has been filled with encounters that take a bit of a “Rock, Paper, Scissors” approach, where you need to pick the right combat style to overcome the opponent, or end up very slowly chipping away at their health while being frequently parried, dodged, or otherwise shot, stabbed or pummeled. Learning each distinct style keeps combat fresher than it would otherwise be, but is also nearly identical to Yakuza 0, which may disappoint series fans looking for something different. If you have played another Yakuza game, you already know whether or not you will enjoy the combat in Yakuza Kiwami. I do enjoy it to a point, and that point is reached when the enemies start instantaneously dodging as soon as the attack button is pressed. You can certainly learn the rhythm of dodging back into position to overcome such foes, but it gets annoying when you swing a giant hammer that visibly passes through your opponent completely, without so much as a dull thud or any contact whatsoever. There’s also a certain boss who somehow manages to shoot you with his guns while dodge-rolling away from your attack, paralyzing you for several seconds over and over and over again who got on my last nerve, but I digress. The boss fights in Yakuza have never been the high-point of the series. Still, as a whole, the combat engine is fun enough to remain engaging, which is important considering how often random jerks will be assaulting you on the streets of Kamurocho. Then again, there’s a certain random jerk who isn’t so random. Majima loves to sneak up on Kiryu throughout Yakuza Kiwami. The headlining new feature of Yakuza Kiwami is called Majima Everywhere, and it makes the strongest case for tempting players that have already played the original Yakuza. Goro Majima makes frequent appearances throughout the Yakuza series, and is an absolute fan favorite. He was one of the playable characters in Yakuza 0, and is just crazy enough to perfectly fill the role of an antagonist that really isn’t that antagonistic. Seeing Kiryu as a rival of sorts, Majima pops up frequently, and quite randomly, throughout Yakuza Kiwami, and is almost always looking for a fight. At first, I loved this feature. The Majima fights were more challenging than other random encounters, but were manageable. But by the end of the game, he turns into a real monster, triggering five minute battles that are absolutely exhausting. He becomes nothing short of a real boss fight, and he doesn’t care how much you want to do whatever it was you were doing when he sneaks up on you from behind a wall. Majima shows up and it is boss time, and the fights include all of the annoyances that come with Yakuza series bosses. He dodges constantly, he shrugs off your attempts to throw him, he counterattacks and he stabs (so much stabbing), creating frequent frustrating moments where you are waiting several seconds to get back into the action while mashing X to get Kiyru to stand up only to be stabbed again. Obviously I need to improve my game, but putting the actual combat aside, I still very much enjoyed Majima Everywhere. Majima is a hilarious character, and the developers clearly had a great time coming up with all the different ways he shows up to attack you. He also brings along not only his 4 fighting styles from Yakuza 0, but several others, so it isn’t like you’re fighting the same boss over and over again… instead it’s like you fighting the same bosses over and over again (one for each style). 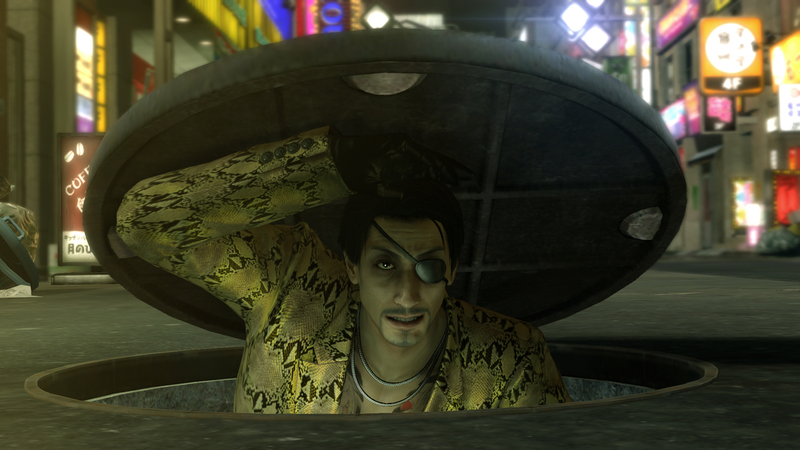 Majima also shows up in many surprising and unexpected ways, including in mini-games and other distractions. I won’t spoil them here, but suffice it to say that those surprises provided the most amusing moments in Yakuza Kiwami, outside of the main story—which Majima thankfully stays away from for the most part. If this is your first time playing Yakuza, prepare yourself for a great story. Kiryu’s original tale is full of suspense, action, betrayal, and everything else you might expect from a game about the Japanese mafia. But it’s also filled with love, friendship, family, and most importantly, deeply developed characters. I’m ashamed to admit that I originally ignored this series because I didn’t think the subject matter interested me. That was a grossly preconceived notion that I regret. By the time the credits rolled on Yakuza Kiwami, it had hit me deeply on an emotional level, despite having experienced this story before. It’s just that well done. It’s made even better for players that have enjoyed Yakuza 0. Yakuza 0 introduces Kiryu at his youngest, and more importantly, develops the character of Akira Nishikiyama, who plays a pivotal role in Yakuza Kiwami. If there was ever an argument for returning players to play Yakuza Kiwami, it’s that the relationships are so much more developed if you play Yakuza 0 first, that they take on new meaning in Yakuza Kiwami. Every plot twist feels that much more poignant and evocative. It can’t be all drama, however. The series is also known for its quirkiness and lightheartedness, especially while helping random strangers around town and pursuing countless distractions. Majima Everywhere adds an extra layer of comedy that acts as a welcome respite from the seriousness of the main storyline. Yakuza Kiwami will make you laugh, cry, and everything in between, and it doesn’t matter whether you’re fighting for your life or taking photos in a photo booth. This game will make you feel. The city of Kamurocho is filled with distractions, dangers and temptations. And when you’re not too busy fighting or helping everyone in town, there’s plenty to distract you. 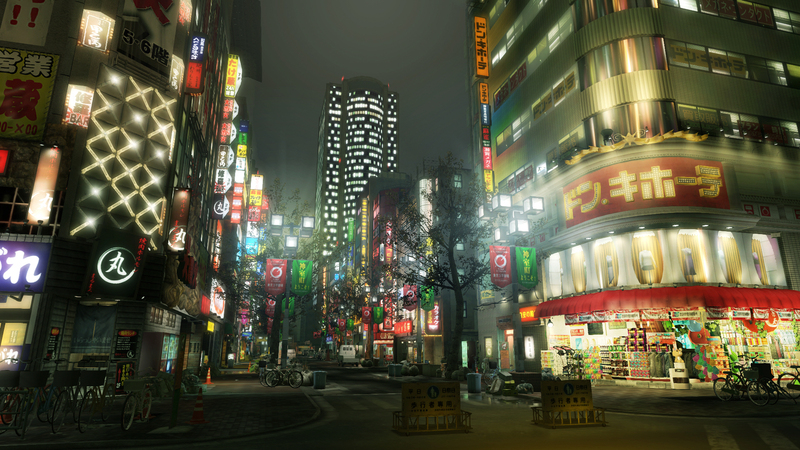 Yakuza Kiwami filled Kamurocho with the vast majority of games and activities from the rest of the series. You can sing Baka Mitai at Karaoke for the umpteenth time, take a few swings in the batting cages, earn some stuffed animals from a UFO catcher, play billiards, darts, bowling, shogi and mahjong, and of course there are a couple of clubs with hostesses you can try to win over, complete with live-action videos (that may or may not be incredibly creepy) to reward you for your lustful ambitions. They even brought back the pocket circuit races from Yakuza 0 (and the associated characters)! There’s also a coliseum where you can test your skill and rack up points for a variety of rewards, including some that are necessary for teaching Kiryu some of his move-set. The enemies here are all fairly challenging if you pick the wrong style, and usually quite easy once you figure out their weakness. The exception is Charon Martinez, who, for some reason, is able to punch you from close range in a single frame and knock off a third of your life, and seems able to counter pretty much anything you throw at him. No enemy in Yakuza Kiwami (aside from that jerk with the guns) made me want to throw my controller more than M. Charon. If that’s not enough, there is a plethora of ways to gamble, including poker (and several variants), roulette, blackjack, baccarat, cee-lo, cho-han, koi-koi and oichi-kabu. Finally there’s MesuKing, which reuses the animations from the cat fights from Yakuza 0 (where scantily clad women wrestle as a result of rock-paper-scissors), and puts them into an arcade game that utilizes collectable cards and is played by all the kids in town. Never change, Yakuza. Between this and Majima Everywhere, an otherwise short game can be extended by dozens of hours. Nevertheless, compared to the absolutely massive games that make up the more recent games in the series, Yakuza Kiwami feels short. Before I knew it the game had been cleared, and I didn’t feel much motivation to revisit many of the activities that I had played so many times before throughout the rest of the series. I did, however, still want to settle my score with Majima. Your mileage may vary, but I very much enjoyed Yakuza Kiwami. The storyline holds up, and is improved by Yakuza 0, and the characters are still great. Majima Everywhere adds a fun level of chaos to the game, and the minigames round out the experience. My only major complaint aside from some frustrations with the battle engine is that so much content is reused from other games in the series. The result is the definitive version of the original Yakuza, without a doubt, but not something that I could describe as new or extraordinary. If you already played the original Yakuza, I can’t call this essential, but newcomers should start with Yakuza 0, and then pick up Yakuza Kiwami for sure. Fortunately, the game has been priced at half the cost of most new releases, which I think is more than fair for what you get. I do hope they give Yakuza 2 and Yakuza 3 the Kiwami treatment! But in the meantime, I’ll be looking forward to Yakuza 6. Ari completed Yakuza Kiwami 40 hours at 74% completion. He received a copy of the game for review purposes from Atlus U.S.A., Inc.